One delicious anecdote from the recent biography Steve Jobs, by Walter Isaacson, involved the Apple founder’s decorating problem: It took the Jobs family eight years to buy a sofa. “We spent a lot of time asking ourselves, What is the purpose of a sofa?” Jobs’ wife told the biographer. To Jobs, the choice about which sofa to buy and where to place it in the home could not be made without a full understanding of exactly what role the object should play in their lives. While Jobsian perfectionism can leave you with a empty house, his instinct to consider function is a good one. This is especially true of a TV set, because the purpose and role of television in our lives is about to change profoundly. When TV first appeared in American living rooms in the 1950s, it usually came in the form of a wooden cabinet housing a screen at about thigh level aimed at a couch. TV had only one purpose, which was to show live broadcasts consisting of news, education and entertainment. The role and purpose of a TV set is undergoing a total transformation. Within five years, this seismic shift will be complete for most households, including yours. 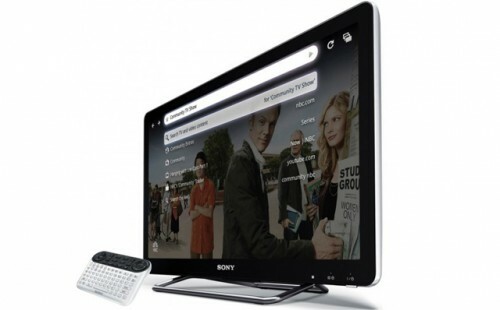 Google TV "smarts" come built into some major brands of TV sets, such as this Sony NSX-24GT1. A TV is becoming nothing more than a computer screen designed to be viewed at a distance, and often by more than one person at at time. People rarely look at PC screens from more than 3 feet away, or TV screens from fewer than 3 feet. The distinction between the content viewed on a TV and on a computer is now gone. People watch TV shows on their laptops and YouTube videos on their TVs. But a coming revolution in “smart" TVs will bring even more computer features to the television set. The biggest addition will be communication. TV has traditionally served as a one-way medium. But future television will involve Jetsons-like video conferencing as one of the main uses for the set. And people will routinely do social networking while watching TV and movies, with the back-and-forth chatter appearing on the screen. The TV as a videophone. The role of the TV as the family’s most important communication device should inform the whole design of our living rooms. Family and friends will be peering into your home in stunning high definition. The part of your home visible from the TV set will gain importance as it becomes a real part of your public identity. 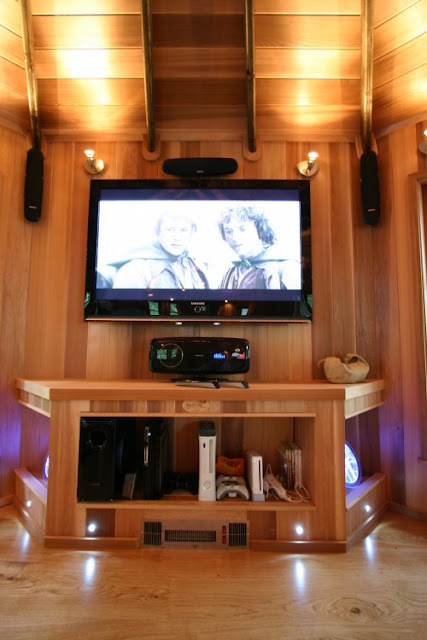 For example, you may choose for this reason to place the TV in the living room rather than the bedroom. Furniture and lighting will be a lot like Hollywood set design and lighting — because your life will appear as a kind of movie on the TV screens of others. The TV as a video game arcade. Gaming is another departure for TV. Thanks to innovations like the Nintendo Wii and Microsoft Kinect for Xbox 360, gaming has gone wireless and involves physical movement in an open space. The rise of these gaming innovations may push the couch back a few feet to make room for play. It may be practical to choose a coffee table that’s easily moved — or to go without one. The TV as a computer. With the TV offering computer-like functions, but from the other side of the room, input devices like keyboards and mice must be reconsidered. Whatever input devices you use for the TV will become central design elements in your room and will probably be in full view all the time. For those who already keep touch tablets in the living room or carry smart phones, the decision is simple: Just use those devices for input. For major brands like iPhone, iPad and Android-based phones and tablets, you can type onscreen or use voice control. Future smart TVs will all have voice control built in. Which brings us back to the sofa and the question “What is the purpose of a sofa?” Smart TV will change what you do on your sofa. Beyond lounging, napping and chatting with someone on a nearby chair, you’ll be chatting with someone on the TV screen, gaming, typing, socially networking and generally surfing the Internet. That knowledge should inform what kind of sofa you choose. In general, you can expect to spend more time in the future sitting up on the couch rather than lying back. The Apple TV is an easy and inexpensive way to make a "dumb" TV smart and also to prepare yourself for the beautiful Apple TV set that's coming to an Apple store near you. A smart TV works like a computer. It runs apps, connects to the Internet and may also connect to other devices in the house on a home network. Although they exist today, smart TVs are undergoing rapid change. A TV isn’t something you’re likely to buy often, so it’s a good idea to think about tomorrow when buying today. Some TVs are born smart, some achieve smartness and some have smartness thrust upon them. Most smart TVs will get their smarts from four sources: Apple, Google, Microsoft or the Asian company that makes your TV. For example, you may buy a TV that’s sold as a smart TV, with the intelligence built in, rather than from a separate plug-in device. This smartness may have been created by the TV maker or by Google and be labeled as a “Google TV." As an alternative, you could buy a TV that doesn’t have a computer built in, but then add an Apple TV box separately. Buying an Xbox game system turns a regular TV into a smart TV as well. The Xbox connects to the Internet and also has a DVD drive for playing not only games but also movies. And, of course, you can mix and match. You can buy a Google TV and plug in both an Apple TV and an Xbox. It won’t be any smarter, though. In general, however, most people will benefit from choosing one of these options and sticking with it for the sake of simplicity. Apple. If you’re an Apple user and carry an iPhone or use an iPad, embracing and sticking with Apple TV is a great choice. The company’s iCloud service connects your devices, so for example the pictures you take with your phone can be instantly viewed on the TV. You should also know that it’s a foregone conclusion in Silicon Valley that Apple will actually manufacture and sell Apple TV sets. These will probably look beautiful, like big iMac machines. By choosing the Apple TV box today, the movies you buy will remain compatible and easily viewable with the future Apple TV set. The future Apple TV will probably also support FaceTime, Apple’s video conferencing app. But this may work only when other people also have Apple hardware. It’s something to know before you buy. And Apple gadgets are attractive to have lying around in your living room. Google. Likewise, if you tend to prefer Google’s Android phones and tablets, you may benefit from a Google TV. Google TV video conferencing will almost certainly take place via the Google+ hangouts feature, which enables 10 people to video-chat at once. This may be more broadly usable because anyone, including those with Apple hardware, will be able to video-chat with you. Apple and Google will probably offer the smartest smart TV options, because they are likely to have the most apps, which will let you leverage that giant screen in all kinds of interesting and unpredictable ways. 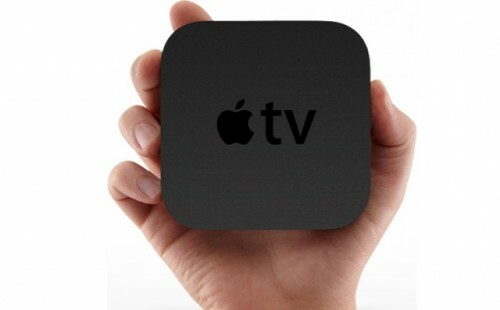 In general, Apple TV is less work, more attractive and more expensive. Google TV is more work and less attractive but less expensive overall. Something else. The only reason to eschew Apple and Google is if another Smart TV option has something you specifically want. For example, if you’ve got a serious console gamer in the house, you may want an Xbox anyway. Ready or not, the smart-TV revolution is coming to a living room near you. And it’s going to change everything. It’s best to know what’s coming. So get off the sofa and get planning!